Palmusic UK Summer Tour 2018! 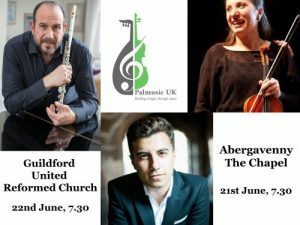 Palmusic UK is pleased to announce a full June of concerts! All the proceeds of the concerts will go in support of our Scholarship Fund. 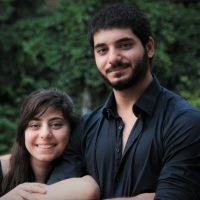 We remind you that our current beneficiaries are Omar and Tibah Saad, and Lourdina Baboun. In this special occasion, the internationally renowned flautist, and our Trustee, Wissam Boustany, the talented pianist Iyad Sughayer, Trinity Laban Gold Medal 2018, and Lourdina Baboun, our violinist from Bethlehem, will present a varied programme of Classical and Middle Eastern Music, including Wolfgang Amadeus Mozart, Franz Schubert, Frederic Chopin, as well as Jordanian-Palestinian contemporary composer Tarek Younis. The musicians will also mesmerise us with unique trio pieces by Jacques Ibert and Mel Bonis. Tickets £12 available at The Art Shop and at the Chapel here or 01873 852690. A Pre-supper of Palestinian food will be available in the cafe. Booking Essential. Our two siblings from the Galilee will bring their music and energy around their host country! They will take us into their particular performance of classical Western music, as well as Arabic music and folk songs. Admission free here, but donations are highly encouraged! Save the dates! We look forward to seeing you all!